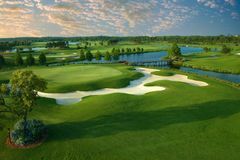 Since Shingle Creek Golf Club opened for play in December 2003 it has been voted one of the “Top 40 best New Golf Courses in the US” by Golfweek Magazine - proof that its statement of being “Orlando’s newest and most spectacular state of the art golf facility” is suitably justified. The golf complex, which is located just east of the Orange County Convention Centre expansion, offers golf which is testing, playable and enjoyable for all. The Dave Harman designed Shingle Creek Golf Club is strongly characterised by its rolling fairways and interconnecting waterways. Its stunning natural backdrop of dense oaks and towering pines along the famous Shingle Creek make it a truly spectacular place for a round of golf. Harman’s objective was to create a golf course which was fair to play but was also a unique and extraordinary test of golf. Helping to make it an enjoyable round is the five different sets of tees on each hole – this allows players to choose their own level of difficulty. The 18-hole course can stretch all the way to 7,228 yards from the championship tees. Additionally, all of the golf buggies feature GPS yardage systems, so you can take a look at a detailed map of each hole before you tackle it. Other first-class facilities that Shingle Creek Golf Club has include a full service 1,600-square-foot pro shop, complementary valet parking, club and shoe rental and the Brad Brewer Golf Academy.